First time I ate this pulao from one of my favourite aunt. 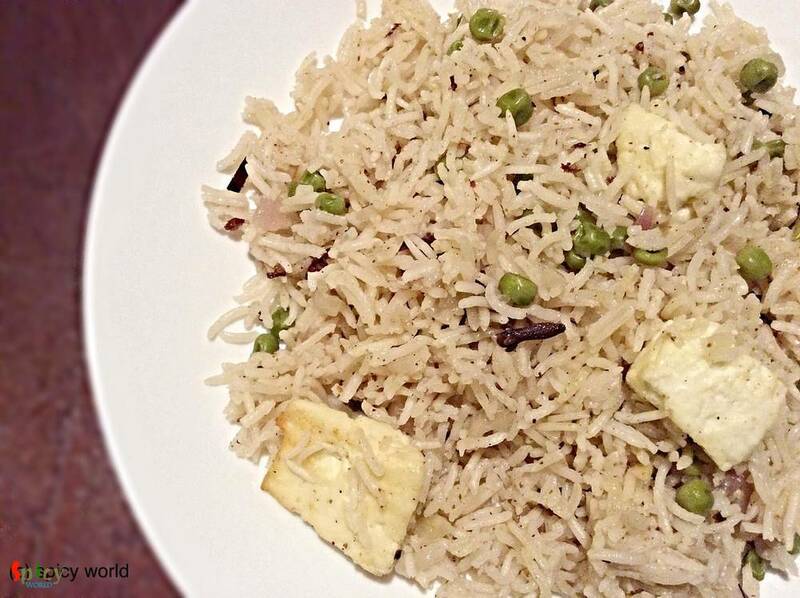 She can turn this simple pulao into something special with her love and care. She really has some magic in her hand and I simply love it. In many gatherings you can make this dish and impress your guest. Whole spices (1 bay leaf, 1 small cinnamon stick, 4 green cardemoms, 4 cloves, half Teaspoon cumin seeds). 5 Teaspoons ghee / clarified butter. Wash the rice very well and soak it for 30 minutes. Take a pan. Heat the white oil. Fry the paneer cubes in oil for 3-4 minutes. Then remove these from oil and keep aside. Take another pan. Heat ghee. Then add whole spices. Saute it for a minute. Add the finely chopped onion. Fry it for 7-8 minutes. Then add the cashews and raisins. Again cook this for 2-3 minutes. Now add the soaked rice, green chilies, 3-4Teaspoons salt and 1-2 Teaspoons sugar. Mix this gently. Then add 1 cup of water and green peas. Stir it 1 more time. Then cover the pan and cook this in slow flame for 30 minutes. Check the pulao twice in between. After that add the fried paneer cubes. Mix this gently, check the seasoning and cover this for 5 minutes. Then turn of your gas and do not open the cover for another 6 minutes. Handle the pulaao with your spatula very gently. Serve this hot with any type of gravy.